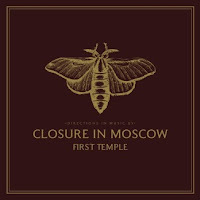 Atlas and the Anchor: Closure In Moscow - "First Temple"
Closure In Moscow - "First Temple"
Australia’s Closure In Moscow are ready to invade our shores with their ambitious and explosive debut album, First Temple, released last month on Equal Vision Records. Combining the soaring, high-range vocals and technically clever guitar work similar in style to The Mars Volta and Coheed and Cambria, Closure In Moscow have created an epic album with mountains and valleys of spastic energy and introspection. Album opener, “Kissing Cousins” kicks the door down with shifting time changes and a big melodic chorus with energy to spare. Followed by the equally energetic, “Reindeer Age”, which sounds like The Mars Volta without all of the World Music flourishes, though the Asian-influenced riffing on “Sweet#hart” does bring a touch of that to the table but with an instantly catchy chorus to sing along to. The inventive guitar noodling on the propulsive, “Vanguard” and wild soloing on “A Night At The Spleen” shows off the skills this relatively young band possesses. On “I’m a Ghost of Twilight”, eerie pedal steel is added to give the song a brooding atmosphere that continues into the next song, “Permafrost” which is the aural equivalent to the desolate emptiness of Siberia which serves as a nice break between the two sides of the album. “Deluge” begins with some pretty vocal harmonies and settles in as the most straight- forward and more accessible songs on the album. “Afterbirth” crashes in with some creative, robotic guitar sounds. To close out the album, “Couldn’t Let You Love Me” an ambient, mostly instrumental song bleeds into the last track, “Had To Put It In The Soil”, a sweet and soaring almost-ballad that acts as the come down from the album’s energetic assault. The similarities to other great prog-rock bands like Coheed and Cambria, The Mars Volta are there but their careful attention to melody and inventive arrangements make listening to First Temple satisfying enough that all of that is forgotten.